After Mayor George Egbert authorized a $44 payment to Cass Lamp Works on December 5, 1879, the first kerosene lamps soon appeared on the streets of Fargo. Police officers were authorized to ensure the street lamps were in proper working order and purchased barrels of oil so the night police units could fill and light the lamps and extinguish them in the morning. By October 7, 1881, the Gas Light and Fuel Company became the city’s first power company and became the Fargo Electric Light and Power Company when franchised on November 7 of the same year. At the same time, the city council passed an ordinance that gave Fargo Electric Light and Power Company the permit for one or more electric light towers approximately 150 feet high with a 20,000 candlepower light. This illumination provided “sufficient strength to read coarse print a distance of two mile[s] from the tower.” It cost $275 per year to operate. 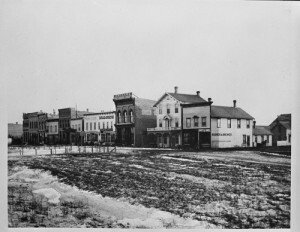 The council additionally gave the Fargo Electric Light and Power Company the street lighting contract on October 5, 1883, and talks for putting streetlights on poles began shortly thereafter. By January 13, 1886, 125-foot lighting towers or “street lights” were completed at the Cass County Courthouse broadening the illumination. Talks would continue to consider adding lights to the two towers already in existence. The first 18 incandescent lights did not arrive until February 4, 1889, but wooden masts for arc lighting were erected in 1890. By August 19, 1890, the city of Fargo offered suspended arc lights throughout its streets. They were later enclosed for increased safety in 1898. With advances in lighting and electricity came improvements in quality of life, bringing business ventures that greatly encouraged permanent settlement and expanded urban plains growth. Businesses that once stood as solitary structures on the flat surface streets of Fargo were soon affixed to a growing array of new proprietors like shoe stores, dry goods, and grocery and furniture stores. This created a “row” effect of mostly-flat top and flat-faced storefronts lining the main arteries of the city. “Electricity, Lights, etc.,” Finding Aid, Fargo N.D. City Council Meeting Minutes, 1875-1910, IRS-NDSU.